Check out this event from the College of the Environment! Please join us for a reading, book signing and reception with award-winning conservationist-activist-writer Terry Tempest Williams, author of the environmental literature classic Refuge: An Unnatural History of Family and Place, When Women Were Birds, The Hour of Land, Finding Beauty in a Broken World, and more. Both the event and reception are FREE and open to the public. Her writing has appeared in The New Yorker, The New York Times, Orion Magazine, and numerous anthologies worldwide as a crucial voice for ecological consciousness and social change. In 2006, Williams received the Robert Marshall Award from The Wilderness Society, their highest honor given to an American citizen. She also received the Distinguished Achievement Award from the Western American Literature Association and the Wallace Stegner Award given by The Center for the American West. She is the recipient of a Lannan Literary Fellowship and a John Simon Guggenheim Fellowship in creative nonfiction. In 2009, Terry Tempest Williams was featured in Ken Burns’ PBS series on the national parks. In 2014, on the 50th Anniversary of the Wilderness Act, Ms. Williams received the Sierra Club’s John Muir Award honoring a distinguished record of leadership in American conservation. Williams also received the 2017 Audubon New York Award for Environmental Writing. To say it’s been a wild year would be an insult to things that deserve the title “wild.” But, here we are, a month into reflecting and trying to understand what even happened in 2018, publishing this article to try to find some sense. And what other than to write about a year at an institution that makes no sense during any given year?! Yes, friends, I am going to try to review this very confusing year––and bonus: I wasn’t even on campus for half of it! Because I am perpetually on the Internet, I have been filled in on the ~happenings~ last semester and will try my best to give 2018 the little justice it deserves. Disclaimer: this is a subjective process, and things change at Wesleyan sometimes very quickly, but also sometimes veeeeery slowly. If I’ve missed something, let us know at staff[at]wesleying[dot]org. Send us your funny moments, your important moments…just all the moments. Because this year was just…a lot…I’m going to do my best to organize this information as effectively as possible. If you want to procrastinate because it’s been a week of classes, here’s some old content: 2012, 2013, 2014, 2015, 2016, 2017. Posted by Meli on February 3, 2019 at 5:01 PM. Betsy DeVos’s most recent changes to Title IX propose to protect those who are accused of sexual violence, and the institutions to which they belong, rather than students. The Trump administrations’s proposed changes include only requiring schools to investigate the most extreme forms of harassment and assault, allow schools to ignore violence that occurs outside of school programs, increase barriers to reporting, and allow schools to delay investigations for months. The good news? We have 60 days to comment. Writing a comment is basically the Education Department version of calling your senators, and it’s the best way to make our voices heard for Title IX. To write a comment, join the Title IX Student Advisory Committee this Thursday, Dec. 6th in the Downey House Lounge. Drop in any time from 4-7 PM. There will be pizza, information on the proposed changes, and guides for how to write a successful comment. It won’t take long, and it’s the best way to tell DeVos #HandsOffIX. Posted by michelle on December 6, 2018 at 4:37 PM. Wes is known for its history of activism. Rage update outlines all public activism that occurred on campus in the past academic year. It seems to have become an every other year sort of thing for us with our first article in 2014, our second in 2016, and now our third in 2018. All articles are definitely worth a read and although 2017 didn’t get an article, it was certainly a year worth remembering so I’ll leave some links to further reading in the end. You’ve now arrived on campus, and we hope that you find your time here enriching and transformative. In that hope, we feel that it would be ill-advised to allow you to not have at least a foundational understanding of the things that have forced us as a community into dialogue, disagreement, and action. This is not to scare you or to give you a negative impression of the University. However, we are certain that most if not all of you were told about the “passion” that Wesleyan students have and the issues that we care about on campus are at the forefront of those passions. While there is certainly no requirement to take an activist stance on any of these issues and it is in fact easy to sink beneath the radar on these issues and all the others not covered here, we would plead with you to be engaged in the community that you are now a part of. Read this, ask questions, and reach out to students and faculty that have been here before you. We hope that as you begin your time here, you fully invest yourself as a community member committed to making Wesleyan as good as it can be for you and for those after you. Caring about Wesleyan does not foreclose critique on Wesleyan and as you read this, and other things like it, we hope you understand that too. Posted by fern on August 31, 2018 at 10:00 AM. On Monday, posters like the one above were put up all over campus, including on most (if not all) senior house doors. The posters call for the removal of Daniel Handler ’92 as Commencement Speaker after repeated instances of racism and sexual harassment. They also call attention to the fact that Dr. Anita Hill, who is known for speaking out against workplace harassment, will receive an honorary degree (a lesser honor and a shorter speech) at the same event. The poster also links to Wesleying’s Write-In: “Commencement 2018: Lemony Snicket, Anita Hill, and Silencing Women of Color in the Age of #MeToo” and a recent article in Pacific Standard by David M. Perry ’95 detailing Handler’s history of sexual harassment. Posted by michelle on February 27, 2018 at 3:24 PM. Kaluuya, Allison Williams, Bradley Whitford. We’re delighted to present a free preview screening of this socially conscious horror flick. A young black man heads upstate to meet his white girlfriend’s parents, where he makes a series of increasingly disturbing discoveries. Posted by Film Board on February 14, 2017 at 5:00 PM. We will be meeting today to discuss how Wesleyan can come together as a community to support Muslim students on campus and raise awareness about the #MuslimBan. Everyone is welcome to attend. Posted by michelle on January 29, 2017 at 2:50 PM. 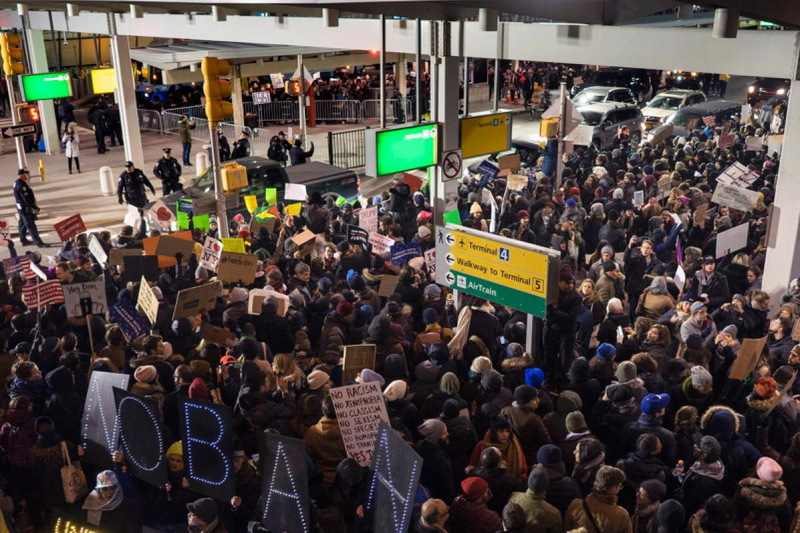 Earlier today, thousands gathered at JFK International Airport to protest the detaining of 12 people from the list of seven majority-Muslim countries covered in Trump’s executive order from yesterday. This order has suspended all immigration from Iraq, Syria, Iran, Sudan, Yemen, Libya and Somalia for the next 90 days, regardless of visa and permanent resident status. The order also bans entry of all refugees for the next 120 days and the entry of Syrian refugees indefinitely. At least a dozen refugees and immigrants from the now-banned Muslim-majority countries were detained by Customs and Border Patrol inside JFK and more–unclear how many–were detained at airports around the country. The protests were posted on Facebook by immigrants’ rights and human rights activists, including Linda Sarsour. Lawyers from the International Refugee Assistance Project and the ACLU were inside the airport, by the arrivals gate, working to get in touch with the detained refugees. At the time of writing one Iraqi refugee had been released but the others were still detained. Congresswoman Nydia Velazquez (NY-7) was inside the airport and at the protests all day to advocate for CBP to release the refugees. Protestors shouted “no ban, no wall” and that immigrants/refugees/Muslims are welcome here. Posted by wilk on January 28, 2017 at 9:35 PM.